Popular in the Netherlands and Caribbean, stand up comedian Jörgen Raymann is known from own television shows such as The Comedy Factory, Raymann is laat, Zo: Raymann, Dat ding van Tante Es, and Baas Raymann. As the official ambassador of the project, Jörgen visited the Dutch Caribbean islands during Dutch Caribbean Shark Week together with the Save Our Sharks team to talk about shark conservation. 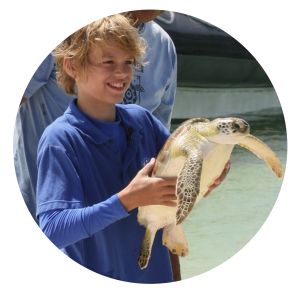 In 2014, at only thirteen years old, Félipe entered the WWF Ranger Action for Healthy Corals and was chosen campaigner of the year winning an expedition trip to Bonaire. There, he had a wonderful time and experienced unforgettable adventures. The journey made him realize the importance of healthy coral and as a way to personally contribute, Félipe started his own foundation Sea & Land Wonders. 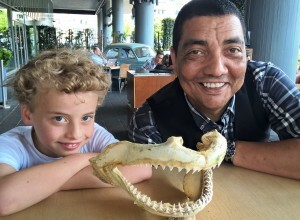 During his stay on Bonaire, Stinapa asked Félipe to be an ambassador for the Save Our Sharks project. And we are very glad he agreed to do this. Félipe:” I feel privileged that I get to champion these beautiful animals. And I’m very proud that I get to be hands on with helping and actually get to contribute. Ever since I can remember, I have been fascinated by sharks. To me, they are the rulers of the ocean. Sharks keep the oceans healthy, which are our largest and most important ecosystems. They play a lead role in an invaluable system that produces more oxygen than all the rainforests combined, regulates the temperature of our planet, and plays a pivotal role in climate control. Having been around for 450 million years, sharks maintain a natural balance and equilibrium that we so desperately need. I would really like everyone to see sharks as I do. They deserve our respect and moreover, they deserve a chance to survive. Don’t we want the same as humans? It is hard to imagine that shark species could go extinct for a simple cup of soup. I am really questioning why we all accept what is happening with sharks and their fins, while sharks are so important for our own future.